While there's a lot of puff coming from several providers, expectations are not being met when it comes to the actual achievement of innovation within many Business Process Outsourcing (BPO) engagements. Consequently, this improves the options for the first-time BPO buyer to select a provider that can demonstrate a proven track record of innovation, but what about the second-time buyer, firmly-rooted in BPO purgatory? 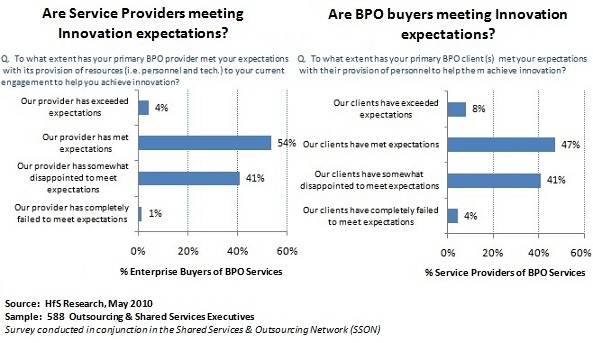 Our brand new survey* of 588 shared services and outsourcing executives, studying the current achievements of innovation within BPO, serves up a major does of realism to the global sourcing industry: buyers want it, but they are not working effectively with their providers to achieve it. And many buyers and providers are pointing the finger at each other. So why should we care? Close to half of enteprises' operational leadership today now view the achievement of innovation as a critical component of their BPO strategy. With most providers operating within a similar price-band today, this is clearly becoming the major differentiator for the first-time BPO buyer, as we first discussed in our "New Normal in Outsourcing Delivery" study, ealier this year. More innovation has currently been achieved across industry-specific, analytics, supply chain and general accounting processes. Customer care, recruitment, payroll and management reporting are noticeably failing to meet customer expectations. The potential to achieve innovation across many core business processes is huge. This was notably cited in industry-specific process and analytics areas, in addition to some maturing BPO domains, namely procure-to-pay, and payroll and recruitment. Major impediments to buyers achieving innovation included unempowered governance teams, and ineffective change management and communications. All-in-all, an increasing majority of buyers are aware they can achieve innovation, and know the potential is there to do exactly that. Moreover, most realize the blame doesn't always sit with their service provider - it rests with both parties to work together to a well-crafted plan that introduces innovative goals and milestones over time, that do not derail from meeting service levels that actually matter. This involves developing more partnership-oriented relationships with their service providers, increased IT-enablement of business processes, and developing gain-sharing metrics based on business outcomes. * The survey, entitled "Are you Achieving Innovation in BPO", was conducted in May 2010 by HfS Research, in conjunction with the Shared Services and Outsourcing Network’s (SSON) network of senior finance and operations executives. It received 588 participants that encompassed senior decision-makers within buy-side enterprises, BPO service provider executives and outsourcing advisors. 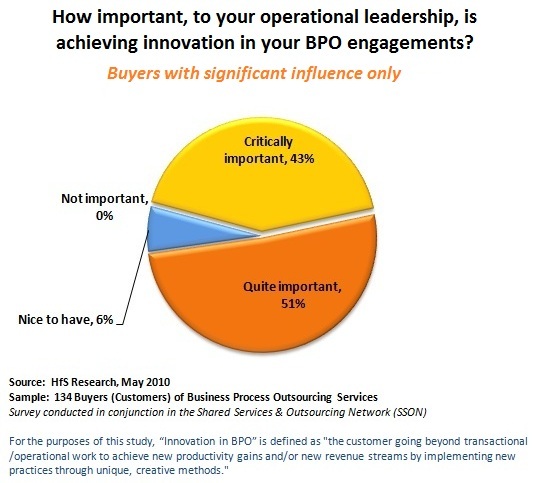 For the purposes of the study, “Innovation in BPO” was defined as "the customer going beyond transactional / operational work to achieve new productivity gains and /or new revenue streams by implementing new practices through unique, creative methods." As a pioneer in outsourcing back in 1989 everything we did was innovation - well OK, new. We worked diligently to mesh in with a message from the start that we would be bringing root cause issues to fix, eliminate, improve, take some chances, and more, to bring innovation. Working under a helping clients succeed (and helping people succeed) banner, we always accomplished this, even in the most difficult situations. Unfortunately, as outsourcing grew, the scale issue and early players diminished this in the offshore lift & drop process, with stabilization and transformation to follow -- easier said than done. Let’s hope this is the wakeup call to move back to the innovation that never quite made it off the PowerPoint slides. I wonder if "expectations" are too low due to the labor arbitrage focus of the buyers or low contractual expectations. For the subset of buyers whose businesses need to change, I wonder if their feelings are equally split. Innovation needs to be institutionalised. 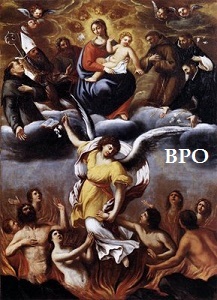 Historically BPO’s have shamelessly copied from other industries which can yield limited results. The industry has its own nuances that need to be studied separately. This can result into innovative ideas. In short, start from a clean slate. Old saying "Necessity is the mother of invention" holds good even today; the more there is pressure to beat the competion, companies need to be innovative; these are well understood by niche players; however can companies make innovation as a "target" and work towards in their day-to-day chores?? Interesting study. Innovation is one of the most abused word in today's context. Starting with labor arbitrage to production efficiencies, BPOs have started going beyond the transactional grind - be it platform BPOs, prediction based BPOs or other innovations. 58% Service Providers meeting expectations or more is a good start in this aspect? or is it? What is the # we are looking at? Cry you mercy, I beg to offer a counterpoint to this research. I suggest that there are many impediments to innovation in a BPO contract. I humbly offer my 'top two'. Firstly, the client's systems are a spaghetti plate of a thousand interfaces. These interfaces lie at the junction between the BPO service and the client's back office. The costs of replacement, integration, simplification or elimination were painstakingly excluded from the negotiations on deal day. Innovation on the systems side becomes a big bill item and squabbling breaks out over who pays. Secondly, the execs on both sides that cut the deal are actually ignorant of the methods, processes, staffing levels and competencies that compensated for the spaghetti so they cut them out of the deal. Every CFO (vendor and user) starts out by hacking costs out of the contract so that s/he can get a 12% ROI or 12% IRR. Result? Integration of the BPO services into client-side back office takes 2x longer than planned. This leaves both sides bleeding from the ears. After this exhausting start, they start talking about innovation when neither side has a cent to invest, the teams are frazzled and the end users frustrated beyond endurance. Innovation requires investment, effort, diligence and smart people - we know it doesn't happen by accident. And we know it isn't free. Lack of innovation is partly just the natural result of rampant short-term thinking. Innovation in and of itself is not the issue. The answer? Front-load the deal with investment. Lose big in year 1, win big later. My experience is that this is the winning formula. @John Amen to John - so Phil, is it innovation or transformation - - both words are overused and not understood and most always an afterthought..? I have to agree with the comments rendered, both point and counter point. Innovation (which may result in transformation) isn't something that you can bestow, announce or even train for. It comes deep from within someones soul and manifests itself in a variety of ways. Often time innovation is misunderstood by those who lack innovative tendancies. It is my contention that the innovation scale, in most cases, starts after a period of time rather than as a priority at the onset of a relationship. It is far to easy to fall into step with current practices or as noted by John that the complexities force us to simple do what is ask rather than address the problem (if it is even viewed as such). Maybe innovation should be viewed as a sourcing virtue than as a commodity that can be used to gain business, then fail to do so? This is a great discussion and one that gets overlooked too quickly by those of us with short-sighted goals - sadly, yours truly included. It takes a good deal of commitment and willingness to invest in innovative techniques and processes. But the issue lies in that it takes time to see the results, as John L noted above. Most are too focused on the cost savings upfront than keeping an eye on long term viability. Both Phil and John Leigh make excellent points in this discussion. Innovation is currently a notional goal in most contractual and practical deals. In my view, there are two main issues: one, is alignment of goals between buyer and provider. The buyer wants improved service and reduced costs, the provider wants higher margin. Both are possible, but only with a degree of openness most providers are unwilling to entertain. The second issue is implementing and managing innovation as a process. The most successful and innovative product companies use a process for developing, evaluating and analyzing new ideas. The application of this process on a continual basis is what makes them successful. The service industry needs to adopt something similar and contracts should be written around that process and managing its adoption, not gain-sharing. @Phil... I'll grant your innovation/transformation in this context although that is another discussion... What are you netting out from the comments compared to the survey (and other data points within) vs. meeting expectations in the second set of data above? Had a couple discussions where others felt the innovation was passed over in the context of the question for the meeting client/provider expectations. Fred - thanks for the input. “Innovation in BPO” is defined as "going beyond transactional / operational work to achieve new productivity gains and /or new revenue streams by implementing new practices through unique, creative methods." Based on this definition, we asked service providers: "To what extent has your primary BPO client / clients met your expectations with their provision of quality personnel to help them achieve innovation?" Unless buyers know the overall market and established benchmarks, their definition of Innovation might be relative to what they do not/cannot do inhouse and hence consider "innovative". So, not sure if we are comparing apples to apples across buyers and suppliers. The BPO industry itself is an innovation, built on currently easily available and low cost communication technologies which wasn't thought possible earlier. While that is no longer considered innovation...the next level of innovations include transactions and interactions being viewed as opportunities rather than transactions alone. A lot of automation is already happening and will keep evolving. Adoption increase and cost decrease for these technologies will also keep taking place... However, ostensibly, the people element will never go away completely...So, as far as the buyers and sellers working together are concerned, it could be about change management throught their individual organizations - "What's in it for me"! Point One - Reflects that, "Innovation is desired"
Multi Vendor Contracts - The Innovation would be treated Client/Buyer's property and shall be made shareable with all the other Vendors involved in the same/similar work - at no additional cost. Point Two - Reflects that, "Innovation is desired"
Data Security Vs. Access to relevant Information/Systems on which Innovation/Improvements can work - This is typical of all third party BPO services contracts. Only exception would be the Integrated IT and BPO contracts.